IVR (Interactive Voice Response) is an automated system, which allows a subscriber to access the information using a special voice menu, by pressing the keys for tone mode or voice (when using speech recognition technology). Today the IVR is definitely the leading technology position for telephony systems. There are two models of information for IVR systems: static and dynamic IVR. Static IVR is quite simple to implement and is based on a voice menu, in which the user has access to a fixed amount of data in the form of pre-recorded voice messages. Dynamic IVR enables the use of constantly changing data along with pre-recorded voice messages. The greatest use of IVR is at the sectors with large number of customers who need to be efficiently serviced. IVR can be used to provide 24/7 informational support of customers, clarification of certain confidential information, telephone banking, televoting, credit card services, etc. When integrating the IVR technology with databases the experience can be very personal, for example by providing the information about account status, etc. At working with a system the subscriber usually has a possibility to switch to a live operator at any time. The IVR diagrams are used successfully to illustrate what is an IVR system and help to depict in details the IVR system’s logical and physical structure. It is easy to visualize how the computers interact with callers through voice recognition and dual-tone multi-frequency signaling (DTMF) keypad inputs. The IVR representations are used to develop, operate and maintain the IVR systems for inbound and outbound call centers and voice mail systems. The Interactive Voice Response Diagrams solution extends ConceptDraw DIAGRAM software with samples, templates and libraries of ready-to-use vector stencils that help create Interactive Voice Response (IVR) diagrams illustrating a work of interactive voice response system, Voice-over-Internet Protocol (VoIP) diagrams, and Action VoIP diagrams with representing voice actions on them. 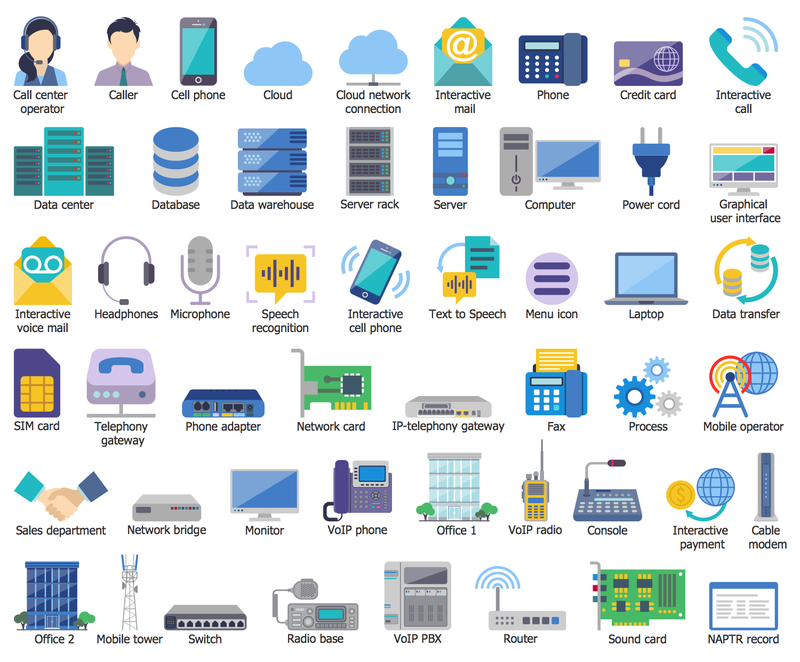 There are 2 stencil libraries containing 68 vector icons and objects along with 19 samples for Interactive Voice Response Diagrams solution. There are a few samples that you see on this page which were created in the ConceptDraw DIAGRAM application by using the Interactive Voice Response Diagrams solution. Some of the solution's capabilities as well as the professional results which you can achieve are all demonstrated here on this page. All source documents are vector graphic documents which are always available for modifying, reviewing and/or converting to many different formats, such as MS PowerPoint, PDF file, MS Visio, and many other graphic ones from the ConceptDraw Solution Park or ConceptDraw STORE. The Interactive Voice Response Diagrams solution is available to all ConceptDraw DIAGRAM users to get installed and used while working in the ConceptDraw DIAGRAM diagramming and drawing software. This diagram was created in ConceptDraw DIAGRAM using the IVR (Interactive Voice Response) Library from the Interactive Voice Response Diagrams Solution. An experienced user spent 10 minutes creating this sample. Today, there are many convenient and profitable methods of recharge. The popularity of the use of IVR system for recharge is growing every day, due to the fact of its simplicity and quickness. What is IVR? The Interactive Voice Response (IVR) is a modern automated telephony system allowing a computer to interact with callers through the use of DTMF tones input via keypad and voice. The IVR system is profitable and useful both for the company and for the subscribers who have an opportunity to get exactly the information that interests them and at any time of the day or night. This sample shows a simple diagram of IVR balance recharge. 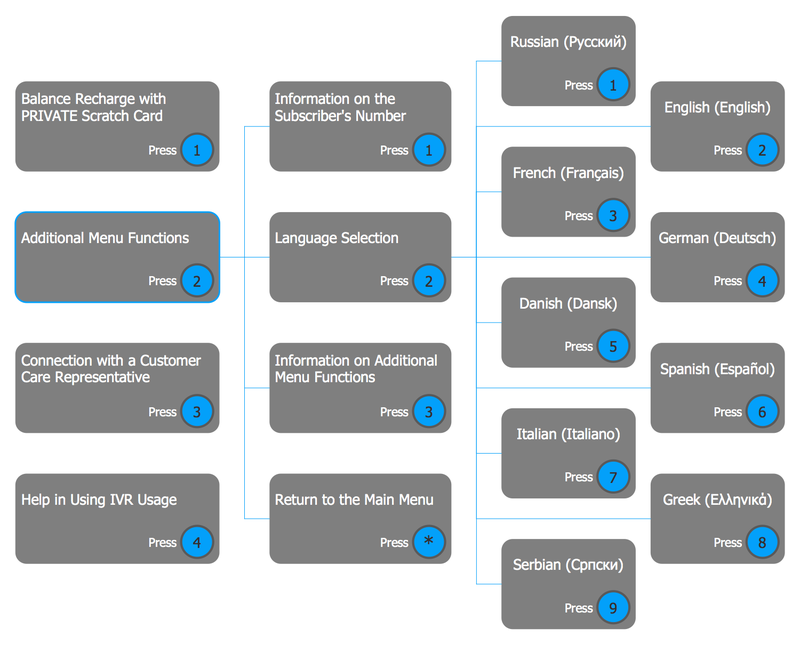 The IVR menu offers four variants on the first stage, the second of them is immediately divided also on four subgroups, one of which is dedicated to the choice of preferred language from the offered list of nine variants. 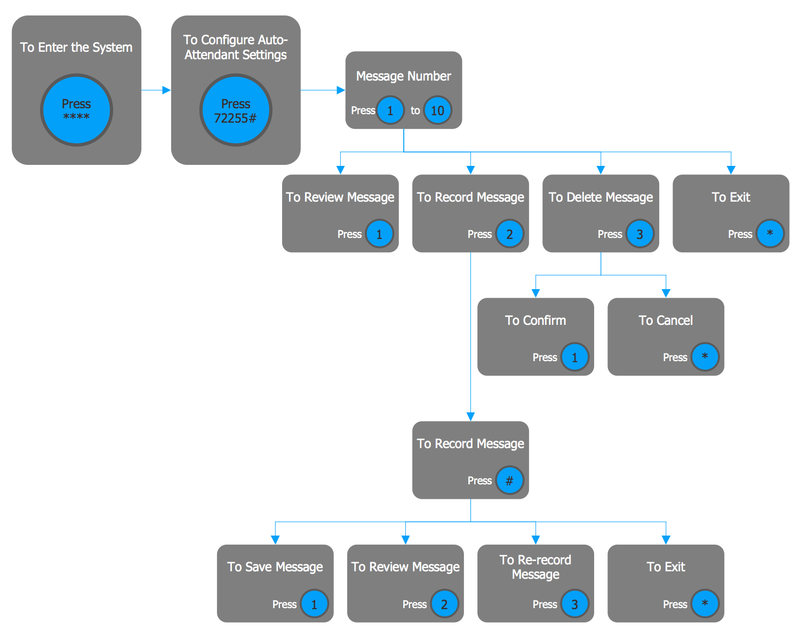 This diagram was created in ConceptDraw DIAGRAM using the IVR (Interactive Voice Response) Library from the Interactive Voice Response Diagrams Solution. An experienced user spent 20 minutes creating this sample. The IVR systems are used to optimize the incoming calls and to direct them in accordance with a topic for further processing. Their main purpose is to save the time on handling incoming calls and to reduce the costs on the maintenance the incoming line. The IVR system has in many cases a multilayer structure with pre-distributed transitions over the submenu. 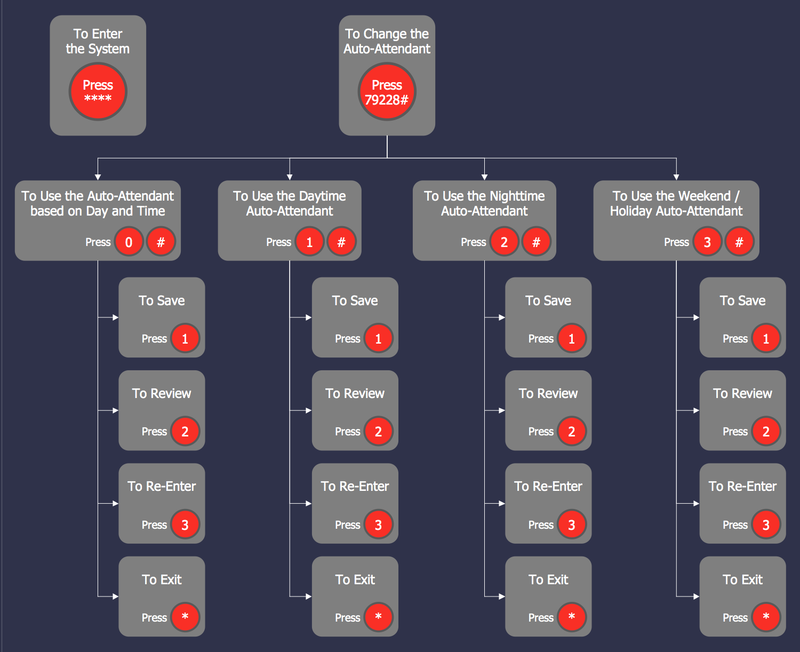 This sample diagram demonstrates an Interactive Voice Response (IVR) Flowchart of the sales reporting line, it has a layered structure that is depicted vertically. This IVR system requires the obligatory introduction of your Store ID and PIN on the first steps to proceed a work. Then, the IVR system offers for your choice the extensive set of ways of progress the future events that will lead you to desired result. No matter how many elements contains your diagram, the ConceptDraw DIAGRAM software will help you to speed up the design process. The IVR system is an answering that plays the corresponding prerecorded information when the subscriber calls. So, due to the IVR system the subscribers always have an opportunity to obtain the necessary information in a real time by the keystrokes. 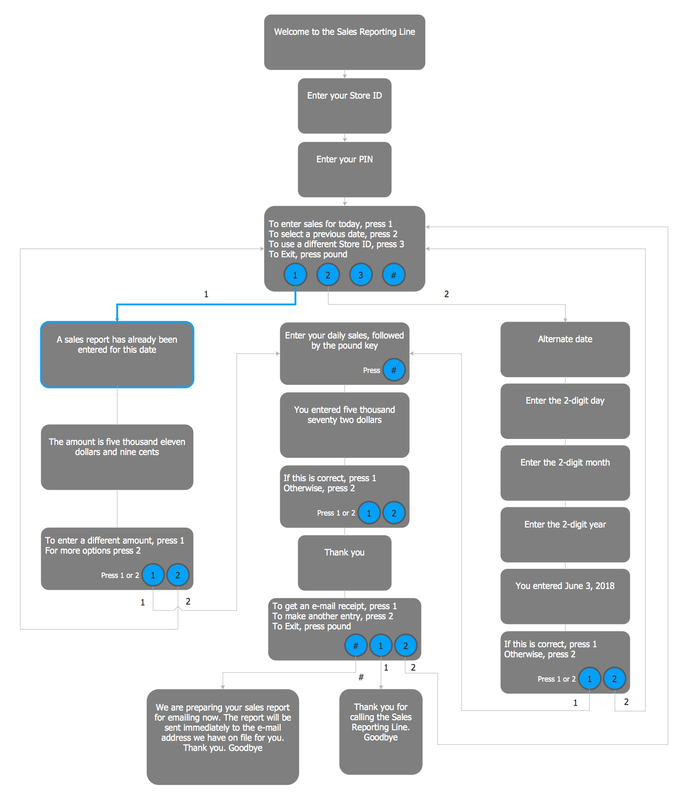 This sample visualizes an IVR diagram represented as a multi-page document. The ConceptDraw DIAGRAM extended with Interactive Voice Response Diagrams solution gives you all opportunities for convenient drawing any IVR diagrams (single page or multi-page), Voice-over-Internet Protocol (VoIP) diagrams, or Action VoIP diagrams. All elements used on the offered diagram are available from the IVR (Interactive Voice Response) library. 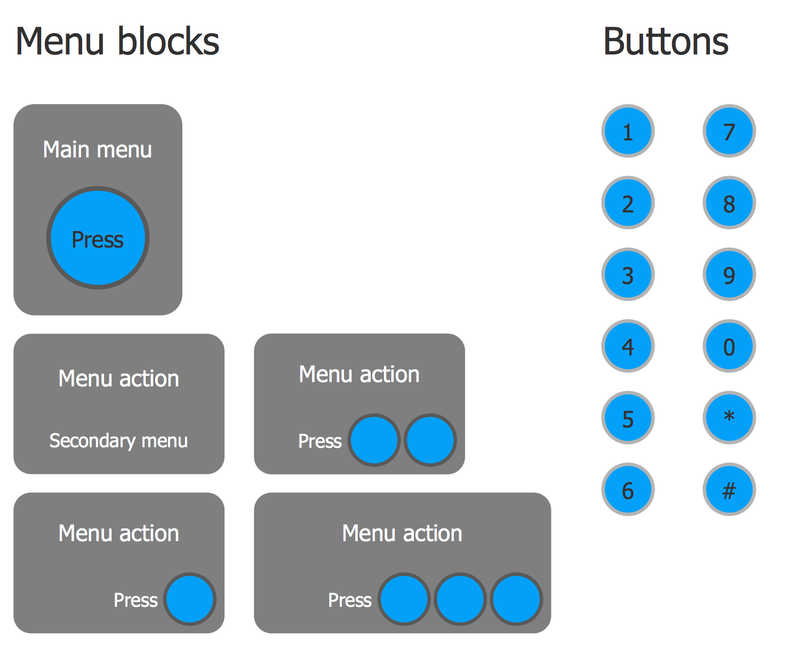 You can use them as designed, or change their dimensions, color, as needed, in some clicks. Try to use the ConceptDraw DIAGRAM diagramming and vector graphic software to design the multi-page documents with professional looking IVR schematics and diagrams, and make sure that it is a highly simple and convenient process. The IVR system allows to attract the customers in a variety of areas and significantly improve the quality of service. The most popularity these systems received at the call-centers, which in most cases are used in such fields as mobile communications, banking institutions, payment system, insurance companies, air and ground transportation, business. This diagram shows a scheme of IVR system at the contacting to mobile operator and decrypts the actions that occur when you press one or another button on the mobile phone. So, at the call to mobile operator it is needed to choose the section at the interactive menu, which most corresponds to your request and to click the appropriate button. After this, you will be redirected to the selected section for further actions. Basing on the scheme, in each of three cases, you may need to make a choice once again and to press the appropriate key. This visual example designed with help of ready ConceptDraw IVR vector objects, represents the IVR services. They are widely used for developing, operating and servicing the IVR systems for voice mail systems, inbound and outbound call centers. 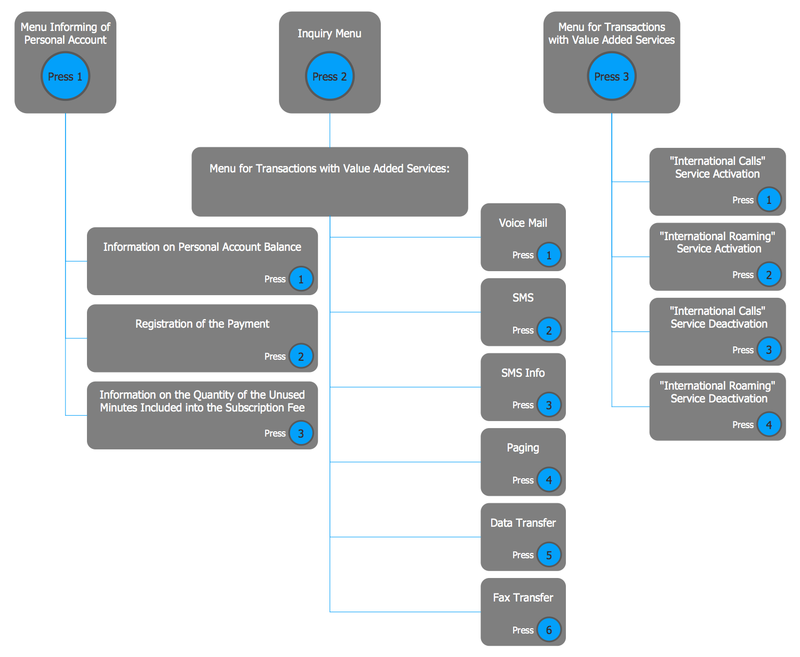 This IVR Services diagram visualizes in details the logical and physical structure of IVR system, the scheme of technical organizing the work of IVR system. It illustrates that at the time of incoming call is run a special application, which automatically activates the playback of a recorded welcome message. Then, depending on what button was pressed by the subscriber 1 to 7, is realized a redirection to the appropriate department, where is played back another pre-assigned audio track. At this, even in conditions of many departments, each of which is responsible for its specific function, the IVR systems allow to realize efficiently the service of large number of calls, at a lowest cost. This sample demonstrates an IVR customer service hotline diagram. The speed of reaction to the call is often a determining factor influencing the customers' trust. The organization of a hotline with help of IVR system and its professional service lets ensure the 24/7 receiving of calls, simultaneous handling of large number of calls, the qualitative service for each client, helps to solve quickly the problems, to settle any disagreements and to keep loyalty to each client. At this, the proper organization of hierarchy and structure of the system plays a significant role. If the structure has too many sub-levels, the subscriber can easily tangle in them. Despite this, for ConceptDraw DIAGRAM software is no matter how many elements will contain your diagram, it will help you speed up design process even in a complex case. Use also the predesigned templates and samples from the ConceptDraw Solution Park to facilitate your work. The earlier versions of Interactive Voice Response (IVR) systems were quite simple, so for example it was impossible to realize the complex scenarios, using the information input in a tone mode. The modern technologies allow to customize the IVR system so that the caller has a stable impression of communication directly with an operator. The call processing scenario and the sound files are configured in such way that a caller has no doubt that he communicates with an intellectual machine. The use of the speech recognition in IVR systems opens up even greater possibilities for their use at the cases, when exchange of information with a system in a tone mode is impossible. 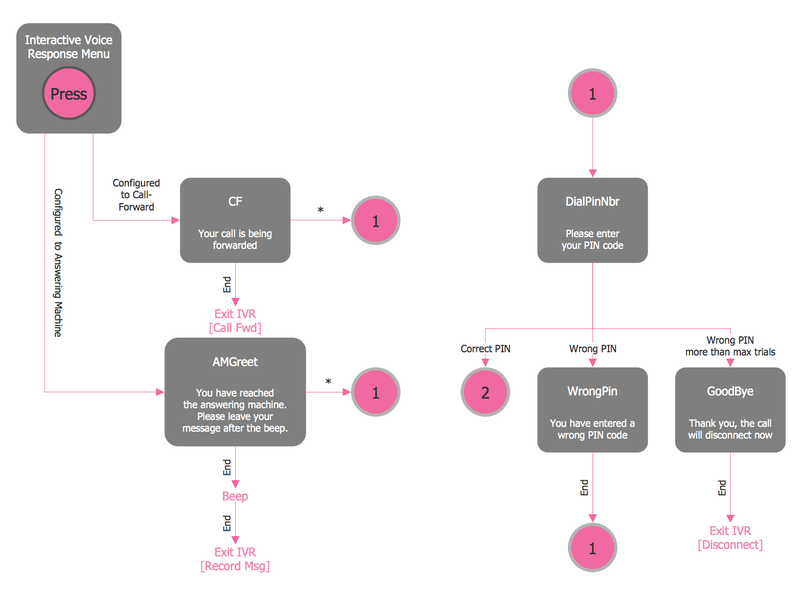 This IVR sample diagram illustrates the work of IVR messaging system, that offers many functions and settings relating with messages. By pressing the corresponding buttons you can easily record the message, save, re-record, review, or delete it. The first telephone systems assumed the presence of a secretary in each office for answering the calls, but now we have the modern technology of Auto-Attendant that automatizes the interactions with telephone subscribers and allows to connect automatically the subscriber with a number without connection with a secretary or operator. The time-based Auto-Attendant system lets vary the variants of messages played to callers depending on time of day or day of week. This sample illustrates the possibility of creation the different messages for four variants of Auto-Attendants. Press **** to enter the IVR system, after listening the voice tips dial 79228# to record the different Auto-Attendant messages for working time, non-working time and even the separate message for weekends. Make the choice between the Auto-Attendant Based on Day and Time, Daytime Auto-Attendant, Nighttime Auto-Attendant, Weekend / Holiday Auto-Attendant using correspondingly the buttons 0, 1, 2, 3 and # symbol. This IVR diagram was designed on the base of "Abb IP telephone gateways" file from the Wikimedia Commons and illustrates the use of a gateway as a mediator between two technologies: IP telephony and PSTN (public switched telephone network). IP telephony or VoIP (Voice over Internet Protocol) is a telephone connection over IP. It is a set of communication protocols, technologies and methods that provide traditional telephony operations, such as dialing, two-ways voice communication, as well as video and multimedia sessions over the Internet or any other IP-networks. The signal is transmitted digitally through a communication channel, previously it is converted and compressed to remove the redundant information and reduce the load on the data network. 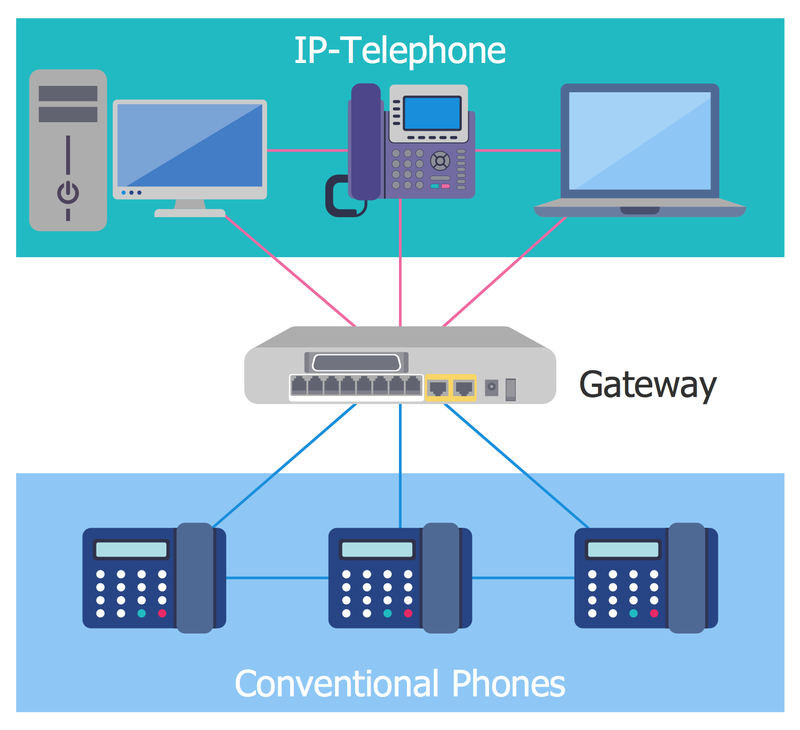 The IP telephony gateway you see on this chart, is an electronic device used to connect the telephone sets, conventional phones or office automatically telephone exchange to an IP network for the transmitting the voice traffic through it. This IVR diagram sample designed on the base of Wikimedia Commons file "Call Center and IVR" depicts the usage of interactive voice response (IVR) system in a work of a call center, which is a centralized office with the main destination purpose of receiving and processing the large volume of requests by telephone. The IVR is an interactive voice communication system that allows users to access the interested information using a special speech menu, by pressing keys in a tone mode or using a voice. The use of IVR is the most popular in customer service industries, it can be used to build the 24/7 customer information support. On this scheme, you can see that when a customer is calling in a call center, this call is answered by the IVR system and then can be forwarded to the departments (sales, support, account, inquiry) depending on the problem’s nature. 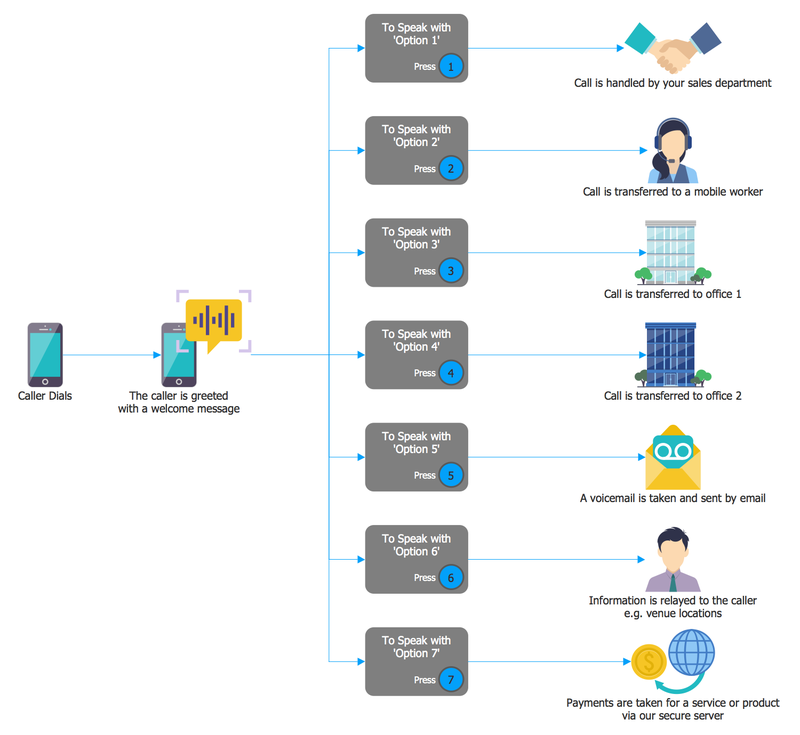 Both ConceptDraw DIAGRAM diagramming and drawing software and the Interactive Voice Response Diagrams solution can help creating the IVR diagrams you need. 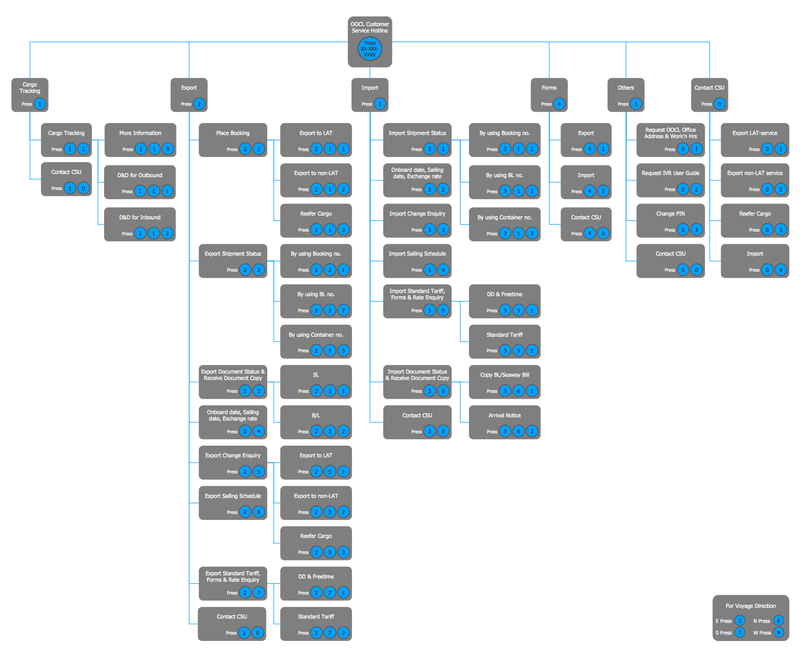 The Interactive Voice Response Diagrams solution can be found in the Computer and Networks area of ConceptDraw STORE application that can be downloaded from this site. Make sure that both ConceptDraw DIAGRAM and ConceptDraw STORE applications are installed on your computer before you get started. After ConceptDraw STORE and ConceptDraw DIAGRAM are downloaded and installed, you can install the Interactive Voice Response Diagrams solution from the ConceptDraw STORE.